The Wong Cho Lam directed Lunar New Year film I LOVE YOU, YOU'RE PERFECT, NOW CHANGE! (NEI MAI LEI, NGOR OI NEI!) has already opened. Cho Lam has been promoting the new film and attending audience appreciation events all over. He even revealed that he went undercover to see the reaction at various cinemas in Hong Kong. Cho Lam even said that some viewers came all the way from the Mainland to support him. He also took the chance to gauge Mainland audience's taste and kill two birds with one stone. Wong Cho Lam yesterday attended a special screening at a Tuen Mun shopping center and shared his directing debut experience with 500 viewers. Cho Lam said that from contacts with 500 viewers all at once, he learned their expectations and views on the film. It truly was a very rare experience. Some viewers even came all the way from the Mainland to support him. He said that he could gauge Mainland audience's taste and kill two birds with one stone. 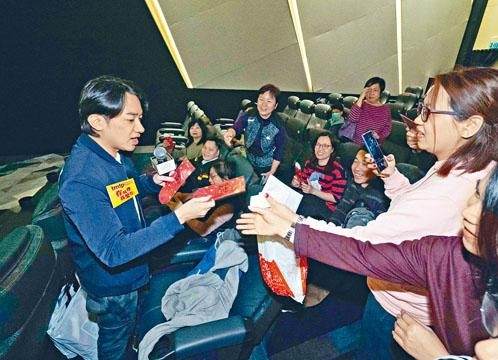 Cho Lam revealed that since the film's release on January 31st, he personally went to different cinemas all over Hong Kong for audience appreciation events everyday and get and understand of each viewers' opinions. Aside from the announced audience appreciation shows, Cho Lam even made several "surprise attack" on cinemas to surprise the audience. He was very happy to see everyone laughing heartily while watching the film. Speaking of audience appreciation, Cho Lam thanked the actors who were also attending audience appreciation events in person like he did. "I can't be in so many places at once. I want to thank them for helping to bring the joy of the film to even more viewers." Cho Lam as usual posed for a group photo with the audience and wish everyone good luck in the Year of the Pig! The China Hong Kong Haikou Association earlier held a Lunar New Year charity screening and supported I LOVE YOU, YOU'RE PERFECT, NOW CHANGE! with a group of guests. Cho Lam, Alice Lau Nga Lai and Li Ni showed their support. The event presented coconuts with the words "Double Happiness" to Cho Lam to wish him double happiness this year in advance. In the end he even posed for a group photo with the audience. Cho Lam asked the audience when they last saw a Cantonese musical film. "My guess is even if you have, it would be the ones from the 60s and the 70s with Sister Fong Fong and Brother Chau. We haven't made a musical film in very long time, so for the Lunar New Year I hope to present a cheerful and cheery Cantonese musical film to everyone." He hoped that musical films would not be limited to just English ones, they should probably have Chinese ones too. This film was about the relationship between the sexes and love. With an all star cast, the film had many hilarious parts. He hoped through this film to give love and joy to those around him during the New Year. Li Ni felt that this event was very meaningful. "This is a charity screening. We of course pay a lot of attention to the donation amount in hopes of repaying of the community." She was very grateful to Cho Lam for giving the ticket, saving 100 tickets for the low income family students. She appreciated that the director's courage to innovate. "I know this film will be around the Lunar New Year, I feel that it is full of love so we click right away. This film is very suitable for our event, a get together for everyone during the New Year to bring the atmosphere of love." In addition, she even thanked the Association volunteers and said that time was very valuable but they still made time to support the event, bring love to the community and the country. She hoped to thank them for their contributions through this film.